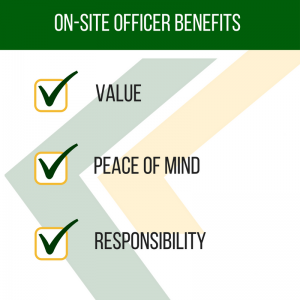 Choosing the right security provider when it comes to on-site officers or patrol services can be an incredibly important decision for your business, impacting not only the overall image of your property but also the peace of mind for your patrons and employees. But that doesn’t mean the decision comes easy. 1. What kind of reports will I receive? You want to know what’s going on around your property. But do you want to receive handwritten reports once a month? Once a week? Some security companies write their reports by hand, leaving the frequency (and legibility) up to chance. Only a few companies will submit daily emailed reports with a customizable amount of information to keep you up to date. We wrote our software in-house to provide the best experience possible for our clients. 2. What if I am not happy with the officer assigned to my property? Maybe you catch your assigned Officer talking on the phone while on duty, or being too short with a customer. If you feel your assigned Officer is not a good fit for your business, it’s good to know your options. Plus, it’s even better to know your security company is able to quickly make the switch if you need it. 3. Is a Supervisor available 24 hours a day if needed? What if you wake up at 2 am to a call for your alarm? Knowing that you can speak to a trained supervisor day or night can help bring you greater peace of mind. 4. What type and how much training do the officers receive? It’s worth knowing that all security officers in the state of Oregon are required to have a minimum of 14 training hours through the Department of Public Safety Standards and Training (this minimum is increased to 38 hours if they are training to be an armed officer). Training through the DPSST includes live classroom instruction, after which applicants take a written examination. Read more about DPSST requirements here. On top of this, security companies will complete their own individual training as well. Ours includes patrol or on-site job shadowing (depending on where the Officer is placed) as well as quarterly educational training courses in subjects like First Aid and CPR, defensive tactics and customer service. 5. Do you have experience with the specific problem I am dealing with? It’s safe to say that security companies see a lot of things. However, depending on the number of years they’ve been operating and the level of experience they look for when hiring their officers, their reaction to the plethora of situations that come up will vary. If finding a company that has seen it all is important to you, ask about their hiring practices and their range of experiences. Online reviews are also a great way to ‘peak under the hood’ to see what clients are saying about a company. Whether you aren’t sure where to start when choosing a guard and patrol provider, or you’re just looking to be thorough, these questions will help you make the most of your search. To learn more about First Response and the Guard & Patrol services we offer, Contact Us or learn more about our services today! According to the FBI website, there were over 160 active shooter incidents between the years 2000 and 2013, underscoring the need for every business to have a plan to prevent an manage an active shooter incident. Sadly, active shooter incidents have occurred in all types of venues, and the trend does not seem to be slowing. Any business can be vulnerable to such a situation, so every business should consider having a plan in place to prevent and manage such an event. What is an Active Shooter Incident? You have had the opportunity to hear the phrase several times since the Columbine tragedy but may wonder what the term “Active shooter incident” means precisely. In most cases, the shooter expects to die in the event, which makes preventive measures the most critical line of defense. Once an active shooting incident starts, it is difficult to stop before there are injuries or deaths because they happen quickly and unexpectedly. This makes layers of deterrents your most valuable option in preventing a potential active shooter. Alert authorities as soon as possible. Call 911 and leave the line open, and hit the panic button on your alarm system. If you can’t get out, hide out. Take cover quickly as possible. As a last resort, take action. Getting physical with a shooter is never a safe option and should only be considered if your life is in eminent danger. This can be done by attempting to disrupt or incapacitate the shooter by throwing items and improvising weapons, and banding together to attack the shooter. Today, every business should consider the possibility of an active shooter incident, and be ready with a plan. If you would like more information on how you can deter crime, please call us today at (800)862-4880.